The concept of a learning path considers training employees on an ongoing process, rather than a one-time event. Growing companies with emerging leaders are increasingly seeing this is the most efficient way to ensure a well-trained, highly productive workforce. What is a Personal Learning Pathway? Personal learning pathways have risen in popularity because it individualizes the use of e-learning, both in traditional education, as well as employee training. Here’s a quick video of Don explaining how to maximize your training results using the Training Path. Training primarily directed by the learner, as opposed to an instructor, which is what we typically see in traditional classroom training, has been facilitated through the use of interactive tools and platforms, where the learner can navigate through training content in a way that works for their needs, their goals and their style of learning. It’s often seen as one of the most effective ways to train employees, because it allows them to build on their existing experiences and knowledge, rather than being at the mercy of an instructor who may not be knowledgeable about their background or their daily job role. Learning Paths International defines this approach as being focused on speed and proficiency. The organization outlines the creation of individual learning paths as beginning with the targeting of a critical function as well as what proficiency in that function would ideally look like. The current learning process is mapped, and then the next step is moving to look at ways to create a new learning path based on that structure. Finally, not only is a new learning path implemented, but there should also be a process put in place for continuous improvement. In another sense, a personalized training path can also be something that as an employer you define for your employees. Using today’s cloud-based learning management system tools, any organization regardless of size should be able to create, personalize and disseminate training paths across a wide variety of learning assets. As organizational leaders, if you spot a high-potential employee, you may want to nurture and develop that employee by offering specific training not available to everyone in the organization or unique to the development of skills that further growth. You can enact targeted training delivery through the use of an LMS, in a way that’s much more efficient, both in terms of time and cost, as compared to any other delivery option. Training paths are based on the concept of learning as a natural progression. It’s more about operating on a continuum. 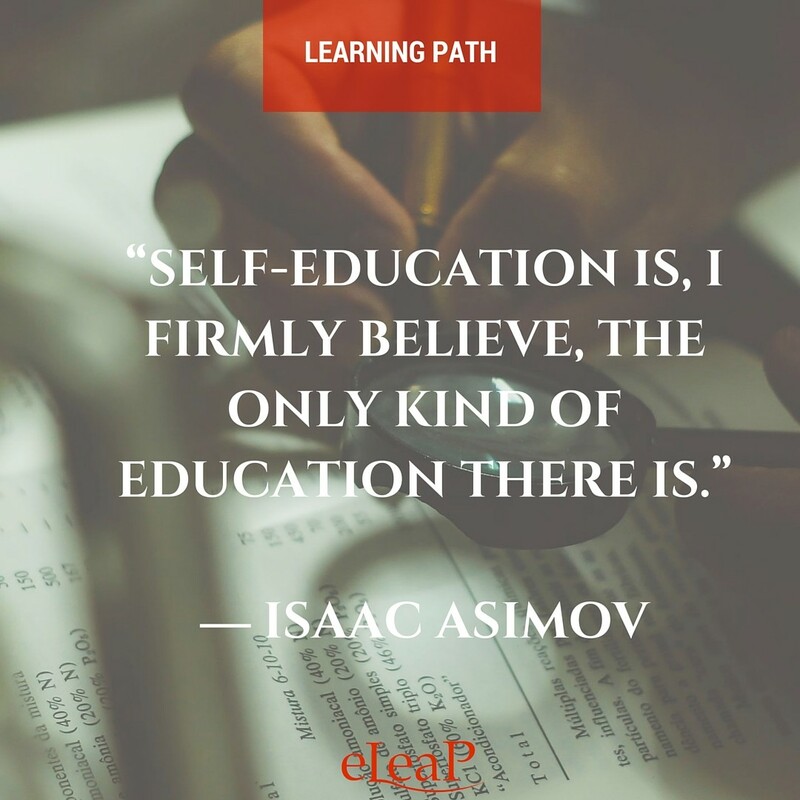 There’s an inherent reliance on self-paced training with learning pathways. It can be paired with some bouts of classroom or on-the-job training, but since it’s a learning experience, it’s most conducive to a self-paced structure. When we’re discussing learning paths in the context of employee training, it’s important that this path is aligned with career path as well. There should a natural trajectory that both training and the career path follow, for it to be a successful approach. Despite the fact that a personal training path is centered on the individual, at its core it still needs to be based on company objectives. The goal should be bringing together the individual’s training and development for the betterment of the entire company. Learning pathways should incorporate input from the trainee. As an employer or a training manager, you’re not really going to know how to best align training with the needs and wants of an employee without using them as a source of feedback. Give your learners control. While ultimately you are driving the learning objectives, you need to make sure trainees always feel that they have a pretty significant sense of control over their learning experience. Some ways you can do this, while still keeping content in-line with business objectives, include designing a navigation style that lets trainees opt how they’ll move through the course, as well as the ability to take certain courses out of order, and the option to virtually interact during training. Assessments are still necessary but should be self-reflective in their design. When you’re managing employee training, you need to know how employees are performing, but with learning paths, you can do things a bit differently. Create assessments, but let employees also reflect on what they did well and what they missed on these evaluations. Then, give them the chance to correct their mistakes. Use your learning management system as a collector of valuable employee data. Some of the biggest problems companies face right now include the ability to retain top employees, problems with the culture that plague their workplace, and how to maximize productivity. You can find answers to these questions and much more if you opt for a learning management system with data reporting that will show you how employees are performing within the framework of individualized learning paths. We understand the importance of training paths, for individuals and also for groups within a larger training group. With that in mind, we’ve created an LMS to include many features that speak to the need to develop and implement training paths, efficiently and effectively. You can create training paths and then assign users to them, and we’ve also recently implemented new customization features that facilitate the creation of individual and group learning pathways, including our Smart Assign function and User Custom Fields. These convenient features are designed to alleviate one of the biggest roadblocks many training managers see in their quest to personalize training, which is that they see it as time-consuming or burdensome. With our new feature rollout, we’re cutting down on the time you spend creating and managing user fields and training paths. With Smart Assign, we’re now giving you the opportunity to create your own framework and guidelines and then apply these to the users you select, so that you can reap the benefits of micro-targeted training. Our User Custom Fields are also another way to make training more personalized. For example, you could add the field “Reports To,” as part of your custom fields, and then distribute assignments based on this criteria. Let us know your thoughts about personal learning and training paths, and whether or not they’re something you use to train employees. If so, what are the impacts?